The DWE7490X Table Saw comes complete with a scissors stand so you don't have to bend or kneel over when making long rips. This table saw features a 15 Amp, high-torque motor with the power to cut pressure-treated lumber and hardwoods. Rack and pinion telescoping fence rails make fence adjustments fast, smooth and accurate. This table saw is backed by a DEWALT 3-year limited warranty for added peace of mind. 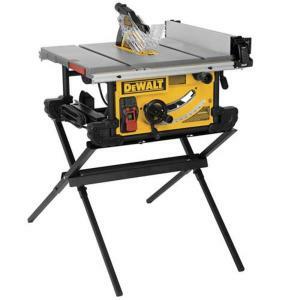 Tbook.com crawls the web to find the best prices and availability on Table Saws and related Tools and Hardware products like Dewalt 15 Amp 10 inch Job Site Table Saw with Scissor Stand. For this page, related items include products we find that match the following keywords: "Table Saw" at our vendor partner Home Depot. Dewalt 15 Amp 10 inch Job Site Table Saw with Scissor Stand is one of 60 Table Saws and related products listed in the Tools and Hardware section of Tbook.com If you have any questions on this product, please give us a call at 734-971-1210 during the hours of 9am - 5pm EST for assistance. Thank you for shopping at Tbook.com, the Internet Department Store!